A good weld always starts with the best metal preparation. When setting up your welder and strike an arc, it is vital to prepare your metal for welding. This can sometimes be needing to make a quick cut. Other times, you’ll need to make a long cut through thick metal. Additionally, you will also need to clean the joint where you plan on welding. Read this article on the 8 ways you can prep your metal for welding. Firstly, you must keep in mind that certain tools will be more appropriate than others depending on your situation. A wire brush is good for removing thick layers of mill scale, slag, or any other thick impurities on a metal workpiece. You will particularly want to keep a wire brush to hand for stick welding, since you will need to brush off the flux when you’re done welding. Remember: certain metals call for specific brushes, e.g. aluminium will require a steel brush. Another good way to remove impurities and imperfections is sand paper. However, make sure you use the right kind of sand paper; using the wrong type can leave residue or damage the metal. When you’re TIG welding, any impurities or chemicals on the metal can cause weld defects. However, if you choose the wrong cleaner this can also cause issues. Some cleaners tend to leave an oily residue. Try using acetone or lacquer thinners in order to clean up the metal without leaving any residue. Angle grinders are one of the most versatile tools to own since you can change the wheels in order to clean metal or to cut small/thin pieces of metal. Welders tend to use 4-4.5″ angle grinders for prepping metal. Whilst larger angle grinders are available, they’re more useful for applications other than welding. A 4-4.5″ angle grinder is a great choice for cutting a small piece of metal, cleaning metal, or smoothing off rough edges. This tool is usually used for making cuts that an angle grinder can’t handle, or at least perform neatly. Chop saws are portable and ideal for cutting metal that is 3/4″ thick or less. Thicker metals are tough to cut which can result in uneven metal pieces and means time lost for the work. Remember: when using a chop saw it is importnt to switch to a thin blade when cutting thicker metal. Unlik oxy-fuel cutting or plasma cutting, a chop saw will send bits of metal all over, making for a messy cutting process. There is a divide between welders on the value of band saws – some think it is ideal to have in a welding shop as it makes better cuts than a chop saw. However, they do take up a lot of space and band saws are not portable. 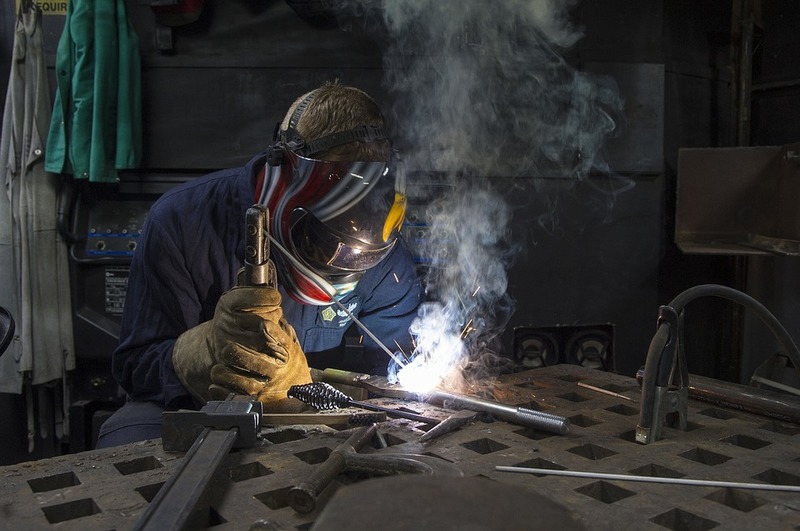 Some welders may prefer to use oxy-fuel or a plasma cutter in order to make cleaner cuts. If you are a welder that cuts a lot of thick metal, an oxy-fuel set-up can be highly versatile, as well as being quick and effective. Oxy-fuel can be handy if you already have a supply of propane or another cutting fuel on hand. Oxy-fuel will make cleaner cuts than a chop saw but it’s kerf will be wider than a plasma cutter. For welders making frequent cuts of thick metal, the answer is a plasma cutter. It is the best way o cutting metal prior to prior. Plasma cutters do involve a high investment up-front, but despite this, they save preheating time and eliminate the ongoing expense of cutting fuel. Plasma cutters make clean, fast cuts with a small kerf which makes them ideal for busy welding shops. If you want to save on employee time and material costs, a plasma cutter is the ideal choice. At WIRS we have one of the most comprehensive ranges of welding supplies and associated welding machinery in the industry. Widely known throughout the UK as a leading stockist and distributor of welding equipment and consumables, WIRS are also specialists in welding machine repair, servicing, calibration / validation and hire. As a quality approved company (BSEN IS0 9001:2000) our customers know they can rely on us as their preferred supplier for all welding equipment, consumables and associated products. For more information on our welding products and services you can visit our website at www.wirs.co.uk, or you can call us on 01902 712525.